Create a FREE online tribute for your loved one on Sunset to Eternity Memorial Garden. It allow you to visit, pray or share the moment anytime and from anywhere. It is free for the first 3 months with any Sympathy flower purchase from our website. From sunset to eternity ... the online garden of remembrance is available to our customers as a free service. It is a farewell to those who personally can not be present at the funeral service. 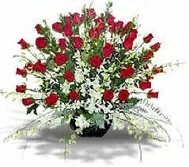 The service is 100% free for the first three months with any purchase of sympathy flowers from our website. After the first three months, the service may be discontinue on your request or a small monthly maintenance fee of $5.99/m need to be paid. However, there is no contract or commitment to continue, you may cancel the memorandum at any time. Click here to visit the Extension Life Garden and call us at 702-868-5512 and ask for Rob if you wish to create the Memorial.